Bryan Gaensler receives funding from the Natural Sciences and Engineering Research Council of Canada. I have a confession: I’m obsessed with magnets. We rely on magnets every day, but seldom give them a second thought. There are magnets in your credit card, your cellphone, your car, microwave oven and computer – and perhaps also pasted all over your refrigerator. Probably the last time you thought about a magnet was in a high school science class. But you should realize they’re the unsung heroes of our world. Someone needs to stand up for magnets, and that person is me. Don’t get me wrong. I’m not a magnet stalker or a magnet groupie. I’m a scientist, and I study magnetism for a living. My main interest is in “cosmic magnetism” – magnets in outer space. Incredibly, magnetism is everywhere in the cosmos: planets, stars, gaseous nebulae, entire galaxies and the overall universe are all magnetic. What does it mean to say that a heavenly body is magnetic? For a solid body like the Earth, the idea is reasonably simple: the Earth’s core is a giant bar magnet, with north and south poles. But farther afield, things get weird. Our entire Milky Way galaxy is also a magnet. Just like for the Earth, the Milky Way’s magnetism is produced by electrical currents. But while the Earth has a molten core to carry these currents, our galaxy’s magnetism is powered by uncounted numbers of electrons, slowly drifting in formation through space. The result is a magnet like nothing you’ve ever seen. First, the Milky Way’s magnetism is unimaginably weak, around a million times weaker than the Earth’s. What’s more, instead of having a single north–south pole, there is seemingly a separate magnet in each spiral arm of our galaxy’s glowing pinwheel: different galactic neighborhoods have their own local definitions of north and south. My own research has two focuses. 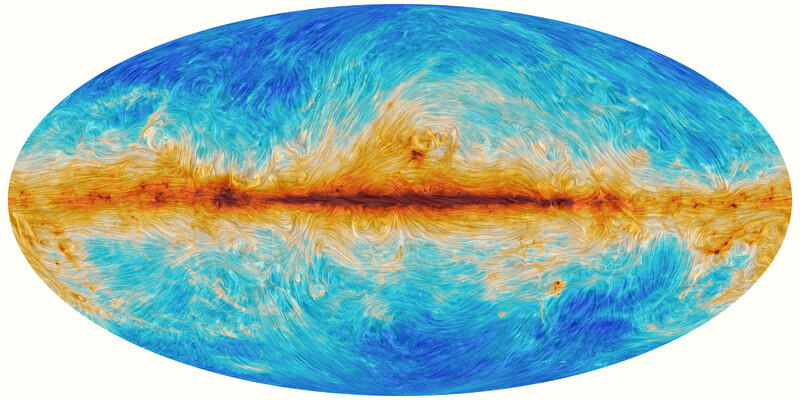 First, what do galactic magnets look like? Where are all the north and south poles in our Milky Way, and in the millions of other galaxies scattered throughout the universe? Second, and more importantly, where did all these magnets come from? How did the first cosmic magnets come into existence billions of years ago, and how have they survived through to the present day? These questions are not quite as esoteric as they sound. Magnetism is vital for stars like our sun to form. The Earth’s magnetism protects our atmosphere from harmful radiation. And cosmic magnets generate energetic high-speed particles which, on arrival at Earth, can cause random genetic mutations and hence drive evolution. On the other hand, the answers are elusive. The big challenge is that magnetism is invisible: point a powerful telescope at a cosmic magnet, and you won’t see it. Instead, we use indirect approaches, relying on the fact that background light is subtly changed as it passes through magnetic regions of foreground gas. I think of it as trying to do the ultimate cryptic crossword puzzle, but blindfolded and with your hands tied behind your back. Of course, one can’t spend one’s whole life just thinking about cosmic magnets. Every scientist has a secret unfulfilled ambition: a completely different scientific career that perhaps, if things had been different, they would have pursued instead. So what’s my secret alternative vocation? Magnetoreception is the ability of some animals to respond or react to magnetism: a “sixth sense” that allows them to see the unseen. The best-known examples are birds, some species of which navigate using the Earth’s magnetic field during their spectacular globe-spanning migrations. But in recent years, scientists have found that a whole host of other species can sense magnetism. Perhaps the most extraordinary case is that of magnetic cows. Using images from Google Earth, researchers have claimed that cows around the world tend to align their bodies with the Earth’s magnetic field whenever they are grazing or resting. Other studies, covering everything from the swimming patterns of sea turtles to the directions dogs face when they defecate, have similarly revealed that animals can somehow sense magnetism. Even humans might have some vestigial sensitivity to magnets. Vision quality seems to depend on whether you’re facing north–south or east–west. Dreams are more likely to be mundane rather than bizarre when the Earth’s magnetism is going through a period of high activity. It’s now been around 2,600 years since the Greek philosopher Thales noticed that magnets attract iron. We understand almost completely how magnets work, right down to the detailed atomic level. Once a curiosity, magnetism is now at our beck and call, and underpins our entire modern world of convenience and technology. We might have completely tamed magnets for our purposes, so much so that we almost never give them a moment’s thought. But both up in the heavens and down here on the ground, there’s still a huge amount we don’t understand about magnets. Where did magnets come from? How have they shaped the universe? And what roles do they play for life on Earth? So please don’t overlook magnets. Magnets are marvelous, mysterious and magical, and deserve both your affection and your respect.